Most people don’t know New Zealand for its backpacking. Native New Zealander Greig Caigou explains how to make the most out of your time visiting. Far flung from Hyperlite Mountain Gear’s home in Maine, my Southwest 3400 pack travelled via CB postage (cabin baggage) to the land ‘Downunder’, to the bottom of the world . . . to New Zealand! 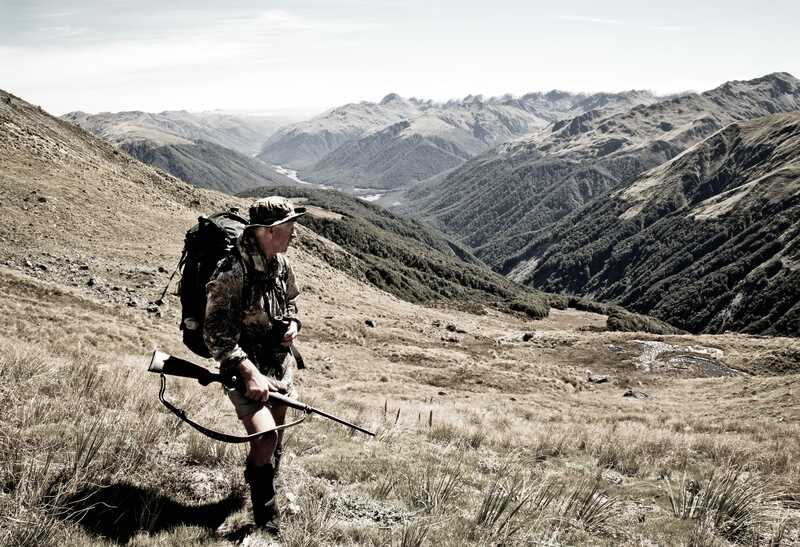 I’m a NZ’er by birth – 60 years young, and an outdoor educator by profession and a wilderness hunter by passion. The author climbs above the Te Araroa trail. Named after our iconic native bird, we ‘Kiwis’ (New Zealanders) are an adventurous lot, with many like myself having had a rural or ‘outdoorsy’ upbringing. As such, we’ve prided ourselves on a rugged lifestyle birthed by pioneering forefathers who just 175 years ago travelled tenaciously half-way round the globe to settle amongst the impressive and varied landscapes of these islands at 41 degrees South. That not-so-old legacy of past pioneers meant I grew up with a bold spirit, always keen for expeditions into the wild unknown, well beyond the back fence. In addition it meant I was raised on country fare . . . home grown vegetables matched with wild meats hunted from the local hills, and resided in a generous community where such produce could occasionally be exchanged for a fat mutton (sheepmeat) or some homebrew with a kick! My new pack has been an integral part of my recent adventures, helping me stay ‘ultralight’ during my work and in my Kiwi-style hunting. Maintaining that simpler and stripped down approach resonates better with a wild experience for me, in touch with the rhythms of nature, but which has been somewhat counter–culture for many who take on the rigors of traversing the backcountry of New Zealand. There are thousands of kilometers of formed trails here, many more established ‘routes’ and perhaps unquestionably the best network of public accommodation ‘trampers’ huts in the world. Let’s say you are planning on heading to this country with your very own Hyperlite Mountain Gear pack and hoping to walk one of our Great Walks or the ‘Long Pathway’ – Te Araroa (TA). So what are some tips for the trail and how could you add some extra pizzaz and design your adventure for something differently wild and uniquely ‘Kiwi’? Trolling the internet you will find an oversupply of gear lists for ultralight hiking, but as a starter for New Zealand conditions check the main Te Araroa trail website. There is a TA Wiki link that’ll get you to some useful supplements and trail blogs. While I can’t cut and paste all my native experience in the NZ backcountry within this one short article, here’s some further points of note for your planning. 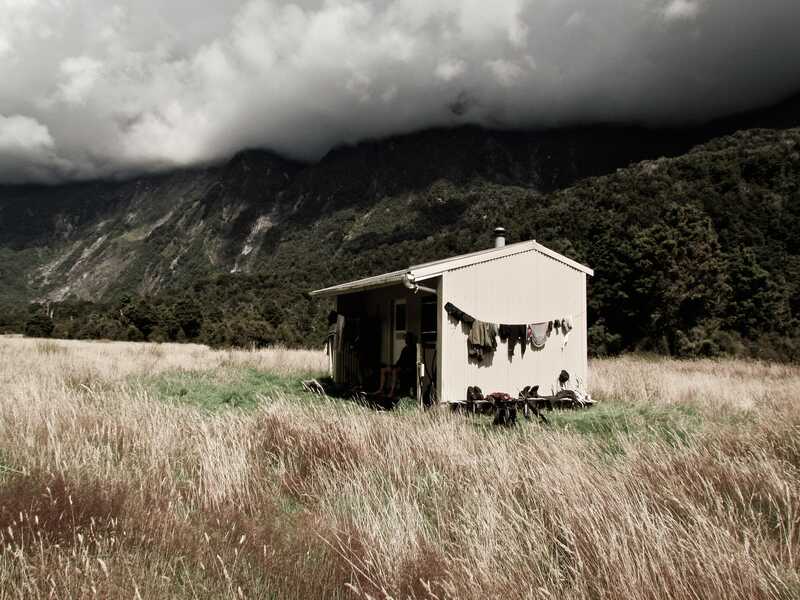 Trampers huts are everywhere along the established Great Walks and the TA trail but you should bring your own shelter so you can enjoy stopping and camping wherever you like, rather than having your adventure be dictated by the distance to the next hut. This is especially important in the latter sections of the TA trail where there are fewer shelters. Seasonal cusps will affect what weights you carry, especially if you bring your own shelter rather than just being dependent on huts. Added up, the maximum weight you might carry on the longer sections of 5-10 days would be around 10-12kgs (about 22-26.5lbs) adjusted by your particular food requirements and possibly the weight of all your electronics and camera gear! You’ll want a bug screen with your shelter – the tiny native Sandfly really bugs visitors to NZ. Thankfully they’re not around at night, and seldom found above the treeline, but any lower in altitude and they’re present, and after your blood. You can lather up with bug spray, but I’m no fan of insecticide on my body. So instead you can cover up, wearing lightweight longs and don’t tarry too long when having breaks . . . or as we say, just take a cement pill and harden up! Key thing is prevention (use bug repellent if you must) but don’t start itching as this often leads to infections. A simple paste of baking soda dabbed on a bite will help keep the itch away. Rainstorms will get you wet up top and a combination of heavy dew and stream or river crossings will deal the wetness to your feet. This is NZ and part of the real experience. Lightweight trail shoes get wet quicker and are fine for most trails, but will dry more quickly and they hold less water anyway. Don’t cross rivers when rain has swelled them, but don’t be so over-cautious that you never experience a river crossing. And don’t faff about taking shoes off to cross – get into it – it’s so cool. Water abounds here, so you don’t really need to carry it either! A litre of water is an unnecessary kilogram of weight in NZ. This is one area I see most overseas trekkers struggling to come to grips with. You can rehydrate at every alpine tarn (lake) or stream you cross – most water is perfectly safe to drink. I carry a flexible silicon Sea to Summit Xcup in my pocket as a way of getting a measured intake of fluids and will only fill my Platy if I’m expecting to be on a ridgetop for the day. 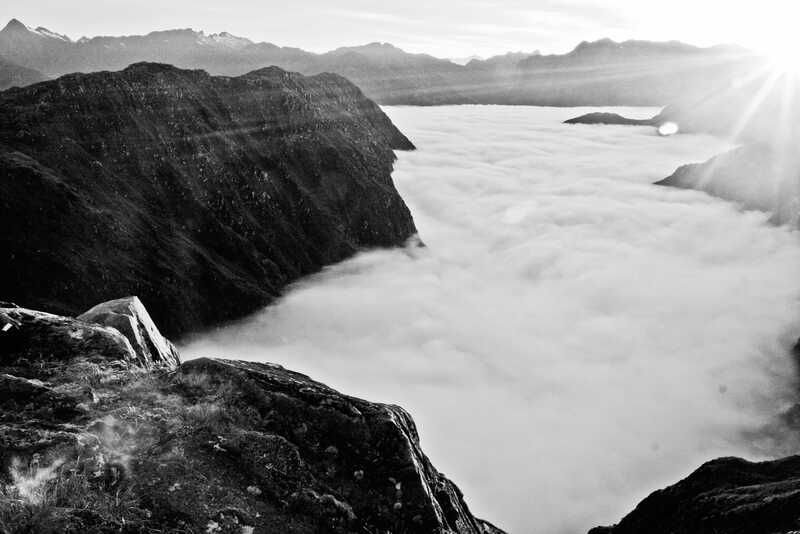 NZ is a mountainous country, rising abruptly out of the sea in the path of swiftly moving pressure systems . . . so expect wind and weather! A shell layer is absolutely necessary. I use my rainjacket also as my windcheater. And don’t be fooled, our weather can change quickly, from blue skies to rain coming in almost horizontally within an hour or so. Snow conditions can also occur in Summer. Trekkers more used to Continental weather patterns cannot rely on tracking weather systems so easily here. Many still underestimate our alpine situation. For example, elevations and the tree line are much higher in the USA so when looking at our maps there is a danger in assuming you won’t be interacting with truly alpine conditions at only a few thousand feet. However, you might want to get the jump on some walkers, as hut etiquette can be lacking amongst so many ‘social’ people and noise considerations, with minimal experience in containing their own gear or in tidying and cleaning the hut – doing the right thing. For me, I get out of camp early! Get prepped the night before, skip breakfast and be on your way . . . you can stop an hour up the trail and enjoy breakfast in the freshness of a backcountry dawn, rather than in a hut with people going through their morning wake up routines and ablutions! You may even see more wildlife. Getting up early has big rewards in New Zealand. Have mini breaks through the day, rather than extended food stops. Lunch breaks can otherwise tend to go longer than expected. Generally you can’t crank out the sort of distances you might be used to because of the type of our terrain. Our tracks are not highways, except on the more manicured Great Walks. Often the trail has not been actively constructed, and will instead be routes worn into the ground by other’s boots and spasmodically indicated by markers attached to trees or rock cairns. Because of this, travel here is measured in time taken, rather than distance. Camp wherever, whenever. Wander freely. New Zealand is great for doing this! No permits are needed. There are no dangerous wild animals. You can drink the water anywhere. You responsibly manage your own creed for minimum impact, leaving no trace because the pathway you choose has less impact anyway . . . fewer will travel your wanderings. 1. Towards the end of your walking day or when coming upon a magic spot, just turn off the trail a few hundred metres and find your very own campsite, out of view. Relax . . . there is no need to join the social throng of a crowded hut. Unless you desire such company, aim to soak up what is so hard to find amongst an increasingly crowded natural experience. 2. Be intentional and take challenging side trips. Look at a section of the main trail, typically approaching up a valley system towards a higher alpine pass that will take you into another catchment. Now comes a turning point in your adventure! When you make the treeline, climb toward the main ridge and make your own way along this spine, parallel to the main trail as it meanders up the valley below. You are now alone! You are negotiating your own route. You are free. And when the day draws to a close, spy out an alpine meadow below, perhaps with a small tarn or at least some hollow in the landscape where there will be mountain-fresh water. Don’t descend yet, just sit . . . wait and watch a while as the evening colours saturate the landscape, so much better than any HDR or Photoshop trickery can mimic. Contemplate the wonder and meaning of life for you! I’d be up before dawn, back on that ridge, ready to inhale the wild, sharing with great mountain peaks as they herald the new day sun. Another day of terrific traverse lies along the crest before you might choose to pick another spur to descend and rejoin the trail. Go discover, yourself. Come check out New Zealand! 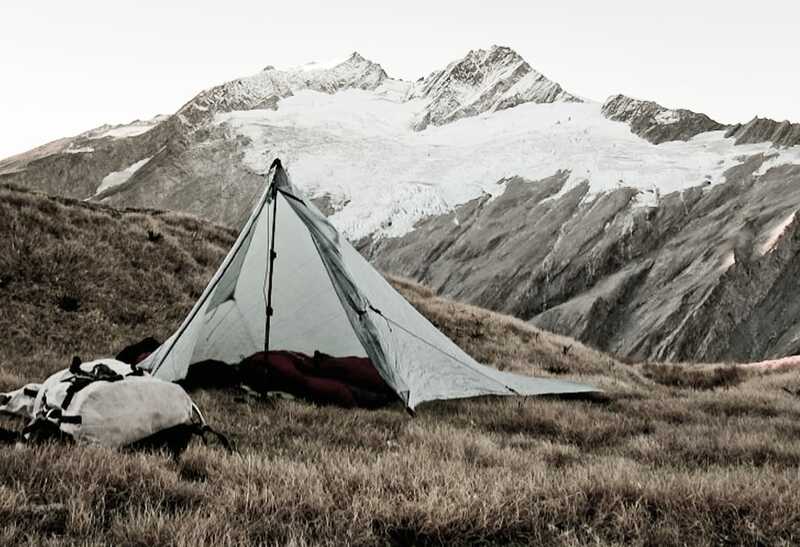 The post New Zealand: How to Backpack “Downunder” appeared first on Hyperlite Mountain Gear Blog.